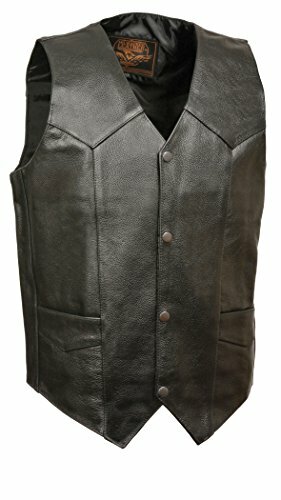 Lightweight classic western leather vest. Western yoke accents. 5 snap front closure. Double conceal carry pockets. 2 exterior pockets and 1 interior pocket. 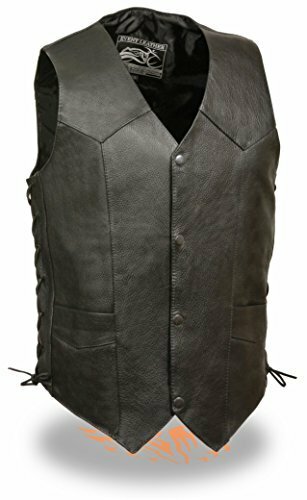 Rustle yourself up a good time with the classic Western styling of the Scully® Rugged Calf Suede Vest. 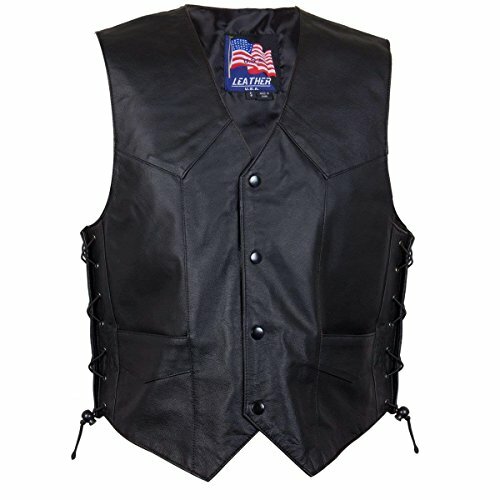 LT and XT sizes indicate Big & Tall versions of this vest. 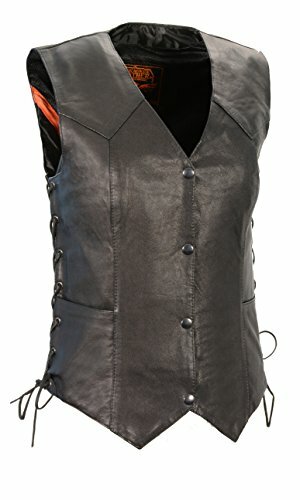 Button-up front with metal hardware. V-neckline. Flat hand pockets. Lined. 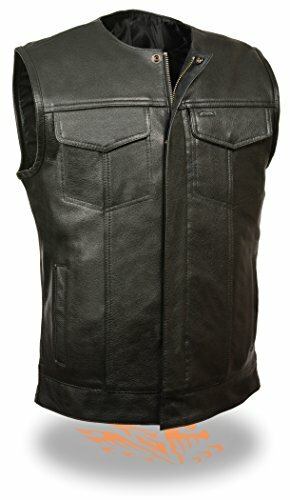 100% leather;Lining: 100% polyester. Professional leather clean only. Imported. Measurements: Length: 23 in Chest Measurement: 44 in Product measurements were taken using size MD. Please note that measurements may vary by size. You will be proud to own this "thing of beauty" from WICKED STOCK. Distinctively milled Full grain leather that will age and patina with you. 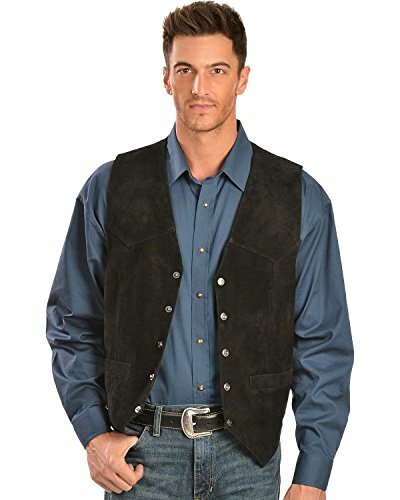 This is the classic western style cowboy leather vest. It will look good on you no matter what the occasion. Made of 1.2mm cowhide leather. Total six pockets. Four outside and two inside concealed carry pockets. Strong YKK metal zippers and hardware. Comfortable inside liner made of non allergenic polyester. Front waist belt for custom fit. Evergreen classic vintage style. Large front and back panels for patches. 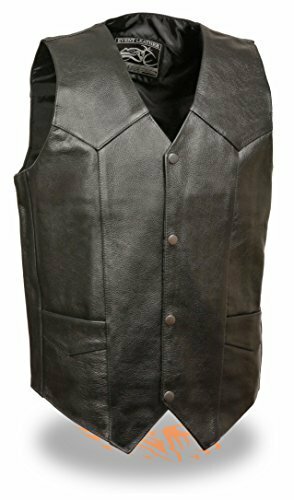 Classic Mens nappa leather side lace vest featuring a four button snap closure with two side pockets. Side lace made of elastic cord for added fit and comfort with adjustable ball closure. Only found here, at LeatherUp. Buy direct from manufacturer and save. 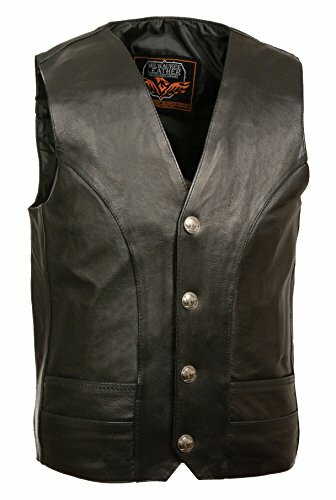 Men's Classic Vest with Buffalo Nickel Snaps. 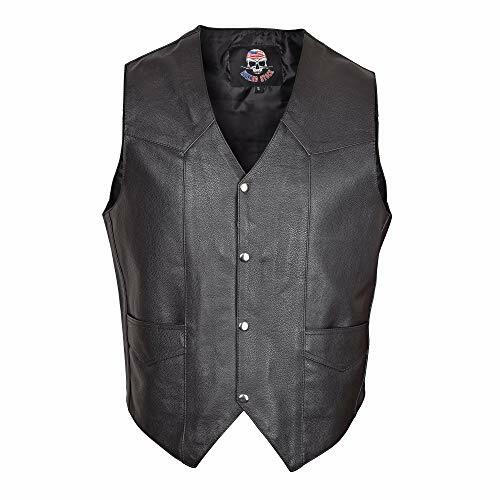 Men's Classic Snap Front Biker Vest. 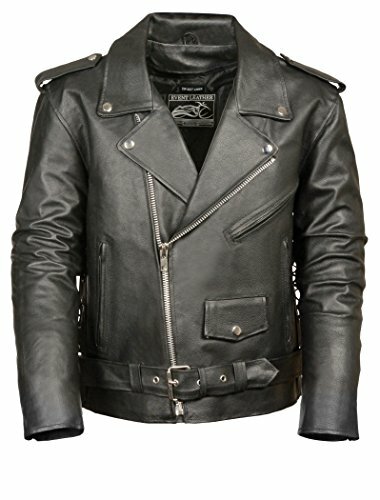 This leather bomber jacket offers a classic look with lightly pebbled finish, crafted from heavy duty top-grain cowhide leather. A bi-swing back design is for freedom of movement. A zip-out insulated liner with polyester fill for extra warmth and comfort allows you three season wear. 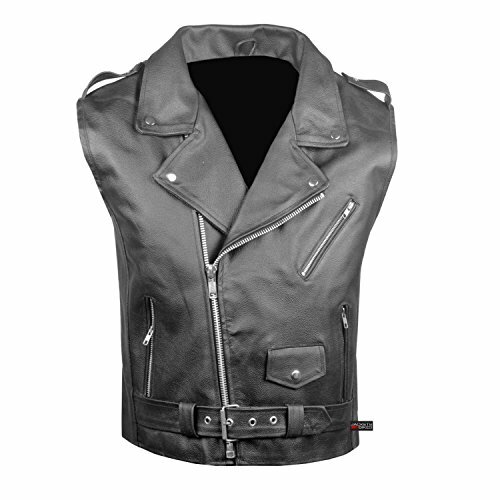 BGSD Classic Men's Motorcycle jacket is made of high quality Cowhide leather and heavy-duty YKK zippers. Action back gussets provide extra comfort and increased mobility while a belted waist keep the jacket tight to the body. Functional shoulder epaulettes and a snap down collar prevent unwanted flapping in the wind. Featuring two vertical zip pockets, one zip chest pocket, one front watch pocket and two interior pockets provide plenty of storage compartments. 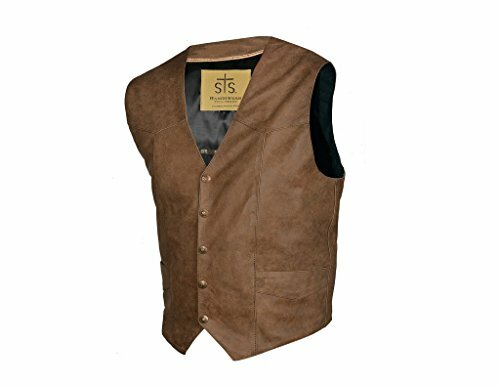 Show off your gentlemenship with this tan color five button vest. 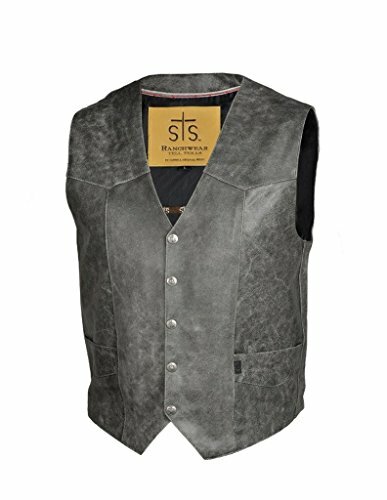 Comparing to its black counterparts, this vest will not only easily match with any dress shirt, but also add a bit of dimension that is absent otherwise. 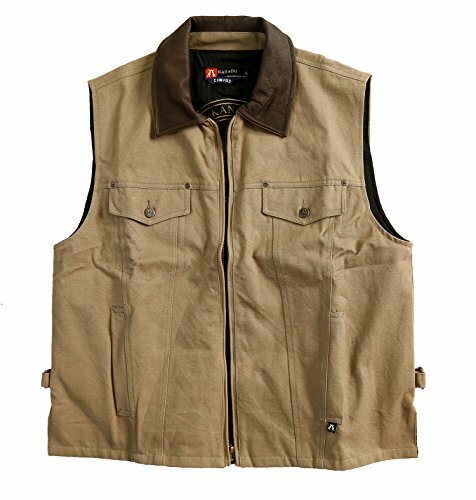 Made of 65 percent polyester and 35 percent viscose, this vest is fully lined ensuring a lightweight vest that won't inhibit movement.Lining: Fully LinedNumber of Pockets: 2Material: Polyester, ViscoseCare Instruction: Dry CleanColor: Tan Lining: Fully Lined Number of Pockets: 2 Material: Polyester, Viscose Vent: Unvented Care Instruction: Dry Clean Exact Color: Tan Size: S, M, L, XL, XXL, 3XL, 4XL, 5XL, 6XL Color: Tan Measurement Guide Click here to view our Men's Sizing GuideMeasurement Guide Click here to view our Men's Sizing GuideAll measurements are approximate and may vary by size. For a little extra warmth over your uniform wear the Classic Fit Collection by Jockey® Womens Sporty Zip Front Solid Scrub Vest. Get pocket space and an athletic-inspired zip up style. Missy fit Stand collar Sleeveless Center front zip closure Front shoulder yokes Back yoke Front and back princess seaming Double slip pockets at right and single slip pocket at left 93% polyester 7% spandex Center back length: 26½"
A faithful recreation of the 1944 flight bomber jacket that was worn by the WWII Army Air Force pilots. Heavy-duty cowhide leather is sewn with two snap close side entry pockets, the oxygen mask retention tab on the left chest, a pair of radio headset cord tabs, and pen-pencil pocket on the left sleeve. A zip-out insulated polyester filling liner for added warmth when temperature drops makes this bomber a true three season jacket. 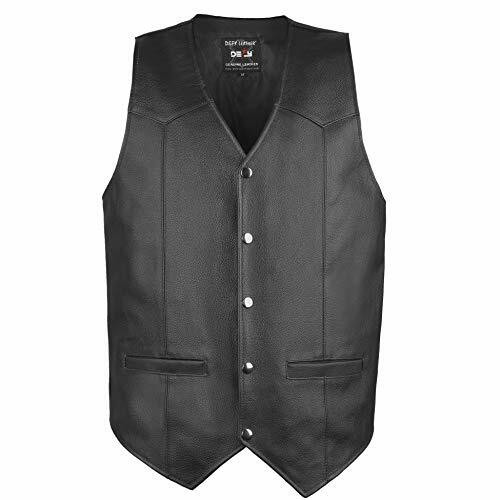 Value priced cowhide classic black leather vest in a heavy 1.2-3mm cowhide leather with extra soft nylon lining. Includes front and inside pockets.